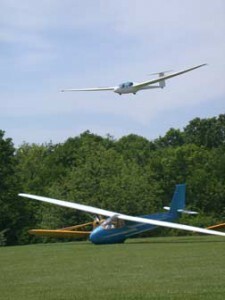 Anyone sixteen or older, in reasonable health, can obtain a sailplane license. We have students as young as twelve, as well as senior citizens learning to soar. Neither a power plane rating nor a medical certificate are required. Typically, 25/30 flights are required to solo, and from 40/100 flights will enable you to acquire your glider rating and license. Power rated pilots can transition to gliders much quicker. All instruction is free for members. You pay only for the tow. Student: Age 14; Solo requirements; Basic flight instruction including stall recovery; Student certificate endorsed by instructor. Private: Age 16; Written exam; Student certificate endorsed; 70 solo flights, or 7 hours of solo flight in gliders, including 35 flights launched by ground tow, or 20 glider flights if launched by aero tow. Oral and flight tests. Commercial: Age 18; written exam; 25 hours of pilot time in aircraft including 20 hours in glider and a total of 100 glider flights as pilot-in-command. Oral and flight tests. Private Rating SEL: Total of 40 hours in single engine airplanes, including 10 solo flights. Oral and flight tests. Commercial: Total of 200 hours pilot time in heavier-than-air aircraft including 20 glider flights as pilot-in-command. Oral and flight tests.